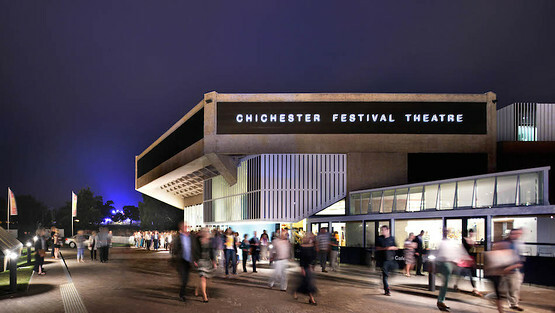 Chichester Festival Theatre is one of the UK's flagship theatres, renowned for the exceptionally high standard of its productions as well as its work with the community and young people. Situated in the lively and beautiful cathedral city of Chichester, the Festival Theatre’s bold thrust stage design makes it one of England’s most striking playhouses – equally suited to epic drama and musicals. Its studio theatre, the Minerva, is particularly noted for premieres of new work alongside intimate revivals. The annual Festival season runs from April to November, during which productions originated at Chichester reach an audience of over 200,000 and frequently transfer to the West End. Year-round programming continues through the winter with the Theatre presenting high-class touring productions, as well as a traditional Christmas show mounted by the renowned Chichester Festival Youth Theatre. Rooted firmly in its community, the Theatre runs a Learning, Education and Participation (LEAP) programme that is a beacon of excellence and inspiration to its local audience, as well as being home to one of the country's largest youth theatres with over 800 members.